Scotty and Mal own Scotty & Mal’s Cocktail and Lounge Bar in Wellington. They’ve been out for decades and so have an interesting historical perspective on what makes New Zealand LGBT friendly. For the first of our interviews with our trusted LGBT locals, I sat down with Mal for a chat to learn more. How is Wellington for LGBT people? Wellington is probably the best city in the country for LGBT people. Cuba Street, where our bar is located, is famous for being bohemian, hippie, a little like the Castro in San Francisco on a much smaller scale. Men can walk down the street arm and arm and no one bats an eyelid. Gay people are integrated everywhere. Even the drag queens are in various bars in Wellington, not just our bar. Are you out in your daily life? We’re well known in Wellington, and nationally actually, as fighters for LGBT rights. 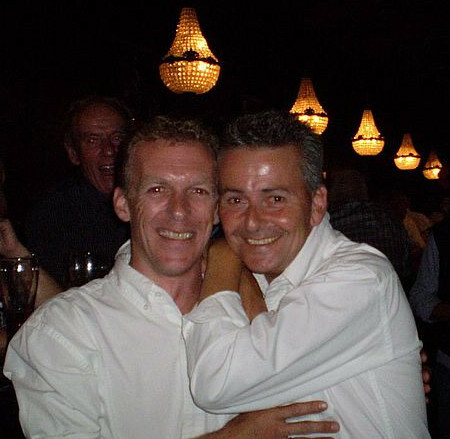 I’ve worked in every gay bar in Wellington for the last 40 years, and Scotty and I have been together 26 years. We won our wedding in a radio marketing campaign to raise awareness for marriage equality, so we are known throughout the country. We’re also very well respected in the hospitality industry throughout New Zealand. In general, is New Zealand LGBT friendly? For a small country we’ve got so much. We’ve decriminalized homosexuality, we’ve got the human rights amendment act that prevents discrimination, we’ve legalised prostitution to assist getting the girls off the streets, as long as they’re registered with local police station then they can advertise in papers. It is still harder for the trans community in New Zealand. Because the LGBT community is so inclusive now it’s getting better, most companies have very open attitudes, most venues have unisex toilets, but there are still some loop holes in the laws that are not equal that we need to work on. But some of our bus drivers in the city are transgender, and it’s their personality that outweighs their gender. No one cares. We’ve also got Drag Queen Story Hour in our local libraries, so we’re making progress. Scotty and I have celebrated all the people who have made our community better and stronger by creating a honorary wall of our heroes in our bar. We want everyone to come in and see it and celebrate our history! Is there still a need for LGBT spaces? People say we don’t need gay spaces anymore, but there is always going to be a need for gay spaces… the bi-curious, people who may want to come out, people who don’t feel comfortable cuddling in a straight bar, that’s why we’re still here for them. Compared to other countries, what makes New Zealand LGBT friendly? Really because we’re such a small nation and have had such a long battle and long hard fight for our rights. During the fight to decriminalise homosexual activity 30 years ago, the so-called Christians were chanting, “Kick them back to the gutters and sewers where they came from.” Normal Joe Blogs on the street were horrified that these people were meant to be Christians and were saying those things about us. It helped our cause. Society has moved on and the ‘old watch’ is slowly dying out. Society has become so progressive. New Zealanders think that as long as you don’t upset me or hurt me, then you’re fine. What makes New Zealand a great destination for LGBT travellers? It’s the country, the scenery is so spectacular. We’ve got everything, the mountains, lakes, great destination all with incredible activities, jet boating, bungee jumping, everything. And New Zealanders are so sociable, so friendly. Tourists who come into our bar say they absolutely love Wellington, it’s such a great walkable city with fantastic museums, galleries, restaurants, cafes and bars. And we’ve got so many American friends who are moving here! We agree! It’s the country. And it’s thanks to people like Scotty and Mal who have made New Zealand lgbt friendly. They are heroes in our eyes for their long-standing involvement in the fight for LGBT rights in New Zealand. Their delightful personalities and genuine Kiwi warmth also makes Scotty & Mal’s Cocktail and Lounge Bar a must visit when you’re visiting Wellington.